One of my favorite things about visiting the local apple orchards are the smell. Most of them bake things as well as sell apples, so the sweet aromas are vented out of the buildings and fill the air as you walk through the orchard. When Eric and I were visiting one last weekend, this was totally the case. It was most likely a combination of the apple pies, apple cookies, and doughnuts that they make that smelled so amazing. They were not vegan however...but they did inspire me to make some apple desserts of my own. One of which was an apple cake. 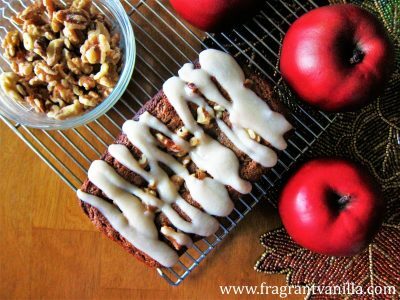 My Mom used to make the most delicious apple cake when I was younger. It was nothing to look at, just baked in a loaf or square pan, but it tasted wonderful! I haven't made any apple cakes in a while, so I decided that I needed to. They are simple, easy, and they always taste good. So win, win, win! This one is made almost entirely in the blender, so there is little clean up. Because who likes to do loads of dishes? Not me. 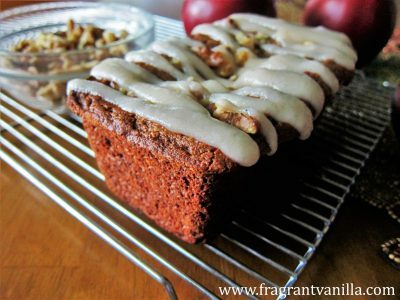 What makes this cake so moist and delicious is the dates and apple that I use as part of the wet ingredients. 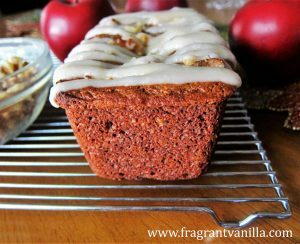 I used a really flavorful local Honeycrisp apple too, which I think always makes a huge difference in the flavor of the finished cake. 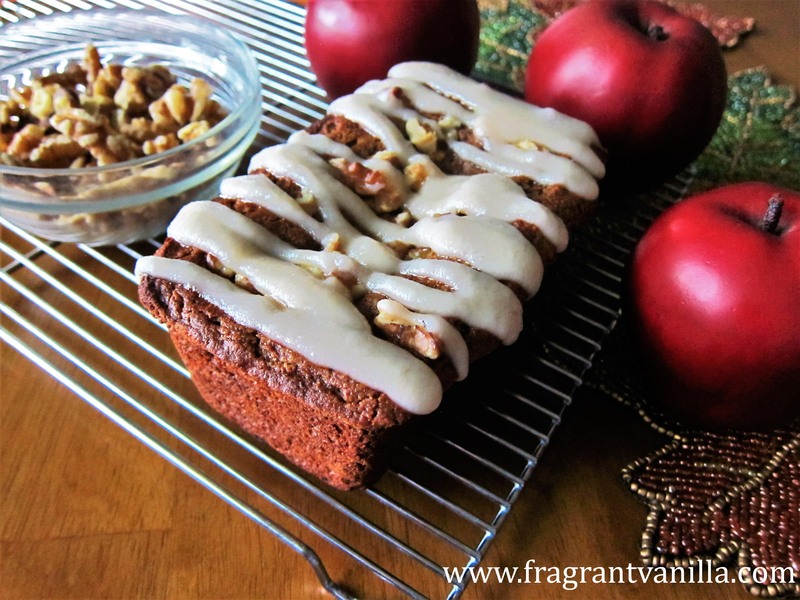 This cake is actually entirely fruit sweetened and oil free! I use a small amount of walnut butter to give it a little bit of richness as well as some healthy omega 3 fats. It is gluten free as well, as I used my favorite gluten free all purpose flour from Bob's Red Mill. It bakes up just like regular flour so you would never know! This cake smelled amazing while baking, just as good as those desserts at the orchard. I glazed it with a maple glaze reminiscent of a powdered sugar glaze I always used to use when I was younger. The cake tasted wonderful! It was the perfect consistency, soft, moist and a little crunchy on top like a muffin. It was sweet thanks to the apples and dates, and the walnuts provided a nice nutty crunch. I was very pleased with how it turned out! You don't have to feel bad about eating some of this for breakfast, I think it would be lovely with a spiced chai! What is your favorite apple dessert or goodie? Preheat the oven to 375F degrees, and oil a mini loaf pan*. To make the batter, combine the reserved soaking water, dates, apple puree, pecan butter, vanilla and sea salt in a high speed blender and blend until smooth. Add the cinnamon, flour, baking powder, baking soda, and blend until combined (but don't overblend). Add vinegar, and blend slowly until bubbles form (you don't want to go fast or you will deflate it). Fold in the walnuts, and pour into the prepared pan. Place the pan in the oven and bake for about 30-35 minutes until a toothpick inserted into the cake comes out almost clean. Let cool completely on a wire rack before unmolding. To make the glaze, whisk together all ingredients until smooth, adding just enough water to create a glaze that can be drizzled but isn't too runny. Drizzle over the cake and serve. *My mini loaf pans are 5x3 inches and 3 inches tall. If yours are smaller, you will get two loaves, and decrease the baking time by half. You can use whichever flour works for you! Thank you :)! Is apple purée the same thing as apple sauce?